It is a well-founded observation: More Catholics come to Church on Ash Wednesday (and Palm Sunday) than they do on Christmas and Easter. Reality, or ‘ecclesiastical legend’? Although I wish it were different, I see this as a hopeful sign. It tells me that, as Catholics we want the world to know that we are baptized into the family of the Roman Catholic Church. 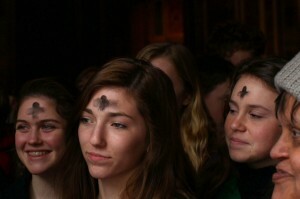 Ashes on the forehead on Ash Wednesday are as ubiquitous as the palm branches on Passion Sunday. Even people from other faiths or who don’t belong to the Church know about our ashes. Catholic or otherwise, these sacramentals raise our consciousness to God. They remind us of our mortality but they also affirm the promise of God to raise us to new life with his Son after we have died. “If only we suffer with him … we may be glorified with him” (Romans 8:17). And so we will be glorified with our Risen Lord but first we must be mortified. This is not so drastic as it may seem, but it does take work. Three key elements exist regarding this universal season of fasting, abstinence, forgiveness, and prayer: temporality; sorrow; and penance. Remember, we are dust; we must be penitent for our sins, and do what we can to express that sorrow through some form of penance, spiritually and/or carnally. God alone knows our souls and he rewards us according to the actions we take toward each other and how well we imitate his Son. On Ash Wednesday we acknowledge our mortality. God created us to live with him forever but we disenfranchised ourselves by sin. The minister traces the sign of the cross on our foreheads with ashes to display our recognition of our mortality and our willingness to repent. As this happens the minister says: “Turn away from sin and be faithful to the Gospel” (Mark 1:15), and the presumption is that we will do this forever. At least, Lent is a good start. If Jesus tells us to turn away from sin then that means its possible. He does not command us to do what we cannot do. Rather, he urges us to be faithful to the gospel because it will make us holy and he sets the example. This universal season of fasting and penance is how we express contrition in the hope of restoring our relationship with God. A common misconception about fasting is that it means not eating. Abstinence does mean forgoing certain foods, like meat on Friday, but fasting itself is more about dietary restriction than controlled starvation. Why go hungry? The idea of restricting our eating for spiritual purposes today seems at best arcane. But fasting isn’t a diet; it is controlling one’s physical appetite through self-mastery for the sake of enjoying a clearer spiritual channel to God. Holy men and women throughout the ages in the Church have always known that fasting is necessary for a fruitful prayer life. “ ‘One does not live by bread alone but by every word that comes from the mouth of God’ ” (Matt 4:4; cf Deut 8:3). Physical desire and weakness simulate our spiritual hunger for the divine fulfillment. During Lent we begin our penitential practice, forty days in the desert, so to speak, to fast and pray and avoid temptation, to purify ourselves in preparation for the Resurrection of our Lord on Easter. Many churches hold regular penance services, which often include confession. We are encouraged to make good confessions and adopt a spirit of contrition as preparation for the Eucharist on Easter. Lenten purification practices— fasting, works of mercy, almsgiving, prayer—prepare us to receive the Body and Blood of Christ, who gave himself on the cross so we might live with him in Paradise. For though we have sinned against God, he remains determined to restore us to new life. As the angel does for Elijah, God provides the sustenance for our Lenten journey. But we have to accept his will. That means going hungry. It means accepting our mortality and bearing in mind how we have fallen short when it comes to living the gospel. Lent is all about the fast: afflicting our souls through sacrificial practices. But it is not just restricting what we eat. It means approaching God with a contrite heart and steadfast spirit (see Psalm 51). We acknowledge the passing away of the world and our mortality and the ashes traced across our forehead initiate that pilgrimage. However, guard against the leaven of the Pharisees. That is, we must not draw attention to ourselves and exaggerate our suffering. Jesus warns us to “not look gloomy like the hypocrites” (Matt 6:16). The ashes we wear on our foreheads are an outward display of our mortality; Lenten penitential acts are an inward display of our sorrow to God who reads the character of our souls. I am particularly devoted to Ash Wednesday and the season of Lent. Personally, I await Lent each year the way schoolchildren pine away for summer vacation. For me, Lent is a spiritual playground when I can prepare to see the glory of the Lord on Easter. Previous ArticleNo Time for Lenten Services? Use the Drive-thru.